Isaac Scuitto was raised in the San Francisco Bay Area, surrounded by the authentic rustic cooking of his Italian grandparents. His love of cooking started in his teens, when family gatherings always centered around delicious, rustic Italian food. With cooking as his passion, he attended the California Culinary Academy. Since then, Chef Isaac has served in numerous high profile culinary positions in the Las Vegas culinary scene including Chef de partie at the exclusive Wynn Las Vegas; Sous Chef at the Sierra Gold and Room Chef at the Aria Resort and Casino. Additionally, Chef Isaac is Serv Safe Certified; he is a certified expert at sanitation, eliminating cross contamination, safe food storage and proper disposal of food waste. This will ensure that you learn to cook safely and instill good habits from day one. 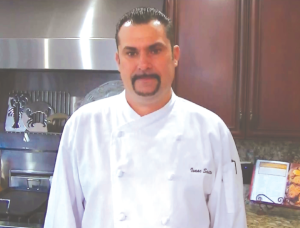 In 2012 Chef Isaac launched Cooking With Isaac, designed for hands on, in-home culinary skills education. His approachable style and in-depth knowledge allows him to cover a broad spectrum of dishes - from beef Wellington to a simple vegetable stir fry. His years of experience training chefs in professional kitchens make him the perfect chef to teach you the skills you want to learn. I was wondering if you teach kids. I have 12 & 14 yr. old boys. I believe it is time that they learn the basics on how to coo and how to use the utensils (eg. knives & stove/oven). It would be great if they also learned about kitchen etiquette, the importance of cleaning the kitchen as well. I would like them to take a few classes with a chef that could teach them how to cook a few different meals (chicken, pasta, meatloaf, etc. with vegetables) comfortably so they could be responsible for a meal once a week. Let me know if this is something that you provide. I would be happy to work with you! Give me call at your convenience and we can discuss what you would like do.